Ever wondered why your broadband data is being gobbled up at a ridiculously fast rate? Why your speeds are suffering? It could be due to the definition settings on your TV or preferred streaming service. Wait a minute, I don’t know what you’re going on about here? Yes this stuff can be confusing, yet it is a simple fix, so bear with us. Very simply put, your Netflix is setup as the absolute best quality. But if you don’t have a TV the size of a cinema screen, you are going to get zero benefit from this…nothing, ziltch! In fact, it will only cost you data and poor performance. A simple change will make all the difference. How much data does Netflix really chew up? Streaming Netflix to your home will use at least 300MB per hour at the lowest quality (not too much data), while standard definition (SD) quality will use 700MB per hour (0.7GB), HD will use up to 3GB per hour (which is lots!! ), and Ultra HD will use a whopping 7GB per hour! 3hrs viewing x 5 times per week = approx 45GB per week on HD quality, and 105GB per week on Ultra HD! Then add in movie and series downloads, iview programs, general browsing, emailing and skype calls, 2 or 3 or more people doing all of the above on different computers…and you could be reaching your data limit much sooner than expected! If you use Netflix, all user accounts are set at a default value of High or Auto (HD or Ultra HD if your device and internet speed supports it). It is strongly recommended you change this to a lower HD setting in your Netflix settings which will reduce your data usage. Also, if your Smart TV is set to HD or Ultra HD then what you watch over the internet will stream as HD or Ultra HD! If you only have an SD TV then streaming content other than Netflix or Stan will be at Standard Definition. Our recommendation is to drop your Netflix definition down to the lowest quality and see how it performs and looks. If it doesn’t look as good as expected, then bump it up to the next option, to Standard or at a push HD – because anyone with a TV smaller than about 50 or 60 inches will see no viewing benefit in increasing the definition. But surely I will see a huge difference if I view in Ultra HD? That’s where it gets a little tricky. We’re talking about a similar jump in resolution as the one from SD (480 lines high) to HD (1080 lines high). And Ultra HD/4K screens are noticeably sharper than 1080p screens. But there are a few reasons you might not feel the same thrill you did when you upgraded your old CRT TV to a flatscreen. When most people went from a 480 to a 1080p set, there was a good chance they were making a big jump in TV size as well. In terms of wow factor, display size is more powerful than any resolution jump could ever hope to be. Last time around most people got big jumps to both screen size and resolution. But this time screen sizes are staying about the same, with the most popular models falling in the 40″ to 70″ range. You need around a 80″ TV (which would take up a whole wall) which the average user doesn’t have and you will need to sit right up close to get any kind of benefit from HD quality…never mind Ultra HD. Not very practical for the family or the way your lounge or movie room is set up. It’s a marketing con and we can’t understand why the Australian government hasn’t stepped in and forced Netflix to set the default value to it’s minimum because it’s killing the entire country’s bandwidth. This would be the correct setting for almost all users without having to go in and mess with your settings, or run out of data, or experience bad speeds. Our advice is that if a user is still on ADSL or NBN 12/1 speed, they should definitely drop the Netflix quality to the lowest option and wait for or order a faster NBN connection and also buy a bigger TV before increasing the quality, otherwise there is no benefit. 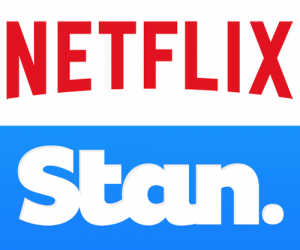 Stan’s streaming guidelines are around 1.13GB on SD, and 2.89GB on HD. Not as high as Netflix but as we have eluded their Standard Definition is more than sufficient in most cases. Some useful Stan links are below. Below is an indication of the data usage and consumption you can expect from the average program lengths. A two way HD video skype call could use around 1.4GB per hour – and depends on the speed of your internet connection. If I have a very large Data plan or unlimited Data then I can stream HD or Ultra HD without a concern? Sort of true, but not entirely. It will still hurt your speeds. There is no good reason having those settings enabled unless your TV screen is absolutely massive and you sit with your eye balls almost touching the screen.